Psalmotoxin-1 (PcTx1, Pi-theraphotoxin-Pc1a) has been isolated from the venom of the Spider Psalmopoeus cambridgei (Trinidad chevron tarantula). PcTx1 is known to block potently (IC50 = 1 nM) and selectively the H+-gated sodium channel ASIC1a (acid-sensitive ion channel 1a). The blockage is rapid and reversible. PcTx1 can distinguish between the two ASIC1 splice variants ASIC1a and ASIC1b. PcTx1 loses its capacity to block ASIC1a as soon as this subunit is associated with another member of the family (ASIC2a or ASIC3). PcTx1 demonstrates an analgesic effect in acute and neuropathic pain models. Fig 1: effect of 30 nM PcTx1 #13PCT001 on ASIC1a expressed in oocytes. Inhibition is nearly complete at this concentration. Product code: 13PCT001. Category: ASIC channels. Tags: ASIC, PcTx1. Acid-sensing ion channel (ASIC) subunits associate to form homomeric or heteromeric proton-gated ion channels in neurons throughout the nervous system. The ASIC1a subunit plays an important role in establishing the kinetics of proton-gated currents in the CNS, and activation of ASIC1a homomeric channels induces neuronal death after local acidosis that accompanies cerebral ischemia. The ASIC2b subunit is expressed in the brain in a pattern that overlaps ASIC1a, yet the contribution of ASIC2b has remained elusive. We find that coexpression of ASIC2b with ASIC1a in Xenopus oocytes results in novel proton-gated currents with properties distinct from ASIC1a homomeric channels. In particular, ASIC2b/1a heteromeric channels are inhibited by the nonselective potassium channel blockers tetraethylammonium and barium. In addition, steady-state desensitization is induced at more basic pH values, and Big Dynorphin sensitivity is enhanced in these unique heteromeric channels. Cultured hippocampal neurons show proton-gated currents consistent with ASIC2b contribution, and these currents are lacking in neurons from mice with an ACCN1 (ASIC2) gene disruption. Finally, we find that these ASIC2b/1a heteromeric channels contribute to acidosis-induced neuronal death. Together, our results show that ASIC2b confers unique properties to heteromeric channels in central neurons. Furthermore, these data indicate that ASIC2, like ASIC1, plays a role in acidosis-induced neuronal death and implicate the ASIC2b/1a subtype as a novel pharmacological target to prevent neuronal injury after stroke. Acid-sensing ion channel-1 (ASIC-1) is a proton-gated ion channel implicated in nociception and neuronal death during ischemia. Recently the first crystal structure of a chicken ASIC was obtained. Expanding upon this work, homology models of the human ASICs were constructed and evaluated. Energy-minimized structures were tested for validity by in silico docking of the models to psalmotoxin-1, which potently inhibits ASIC-1 and not other members of the family. The data are consistent with prior radioligand binding and functional assays while also explaining the selectivity of PcTX-1 for homomeric hASIC-1a. Binding energy calculations suggest that the toxin and channel create a complex that is more stable than the channel alone. The binding is dominated by the coulombic contributions, which account for why the toxin-channel interaction is not observed at low pH. The computational data were experimentally verified with single channel and whole-cell electrophysiological studies. These validated models should allow for the rational design of specific and potent peptidomimetic compounds that may be useful for the treatment of pain or ischemic stroke. Psalmotoxin 1, a peptide extracted from the South American tarantula Psalmopoeus cambridgei, has very potent analgesic properties against thermal, mechanical, chemical, inflammatory and neuropathic pain in rodents. It exerts its action by blocking acid-sensing ion channel 1a, and this blockade results in an activation of the endogenous enkephalin pathway. The analgesic properties of the peptide are suppressed by antagonists of the mu and delta-opioid receptors and are lost in Penk1-/- mice. Psalmotoxin 1 (a component of the venom of a West Indies tarantula) is a 40-amino acid peptide that inhibits cation currents mediated by acid-sensing ion channels (ASIC). In this study we performed electrophysiological experiments to test the hypothesis that Psalmotoxin 1 (PcTX1) inhibits Na+ currents in high-grade human astrocytoma cells (glioblastoma multiforme, or GBM). In whole cell patch-clamped cultured GBM cells, the peptide toxin quickly and reversibly inhibited both inward and outward current with an IC50 of 36 +/- 2 pM. The same inhibition was observed in freshly resected GBM cells. However, when the same experiment was performed on normal human astrocytes, the toxin failed to inhibit the whole cell current. We also determined a cationic selectivity sequence for inward currents in three cultured GBM cell lines (SK-MG-1, U87-MG, and U251-MG). The selectivity sequence yielded a unique biophysical fingerprint with inward K+ conductance approximately fourfold greater than that of Na+, Li+, and Ca2+. These observations suggest that PcTX1 may prove useful in determining whether GBM cells express a specific ASIC-containing ion channel type that can serve as a target for both diagnostic and therapeutic treatments of aggressive malignant gliomas. Acid-sensing ion channels (ASICs) are thought to be important ion channels, particularly for the perception of pain. Some of them may also contribute to synaptic plasticity, learning, and memory. 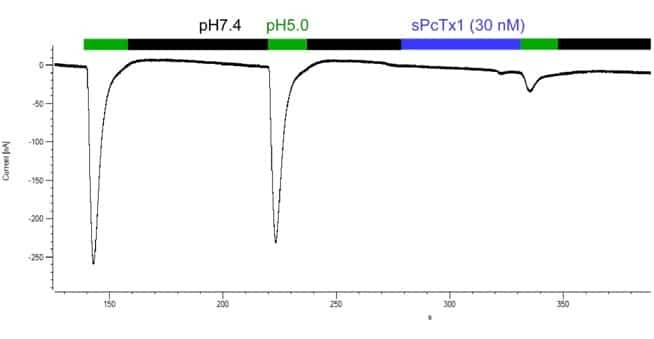 Psalmotoxin 1 (PcTx1), the first potent and specific blocker of the ASIC1a proton-sensing channel, has been successfully expressed in the Drosophila melanogaster S2 cell recombinant expression system used here for the first time to produce a spider toxin. The recombinant toxin was identical in all respects to the native peptide, and its three-dimensional structure in solution was determined by means of (1)H 2D NMR spectroscopy. Surface characteristics of PcTx1 provide insights on key structural elements involved in the binding of PcTx1 to ASIC1a channels. They appear to be localized in the beta-sheet and the beta-turn linking the strands, as indicated by electrostatic anisotropy calculations, surface charge distribution, and the presence of residues known to be implicated in channel recognition by other inhibitor cystine knot (ICK) toxins. Acid sensing is associated with nociception, taste transduction, and perception of extracellular pH fluctuations in the brain. Acid sensing is carried out by the simplest class of ligand-gated channels, the family of H(+)-gated Na(+) channels. These channels have recently been cloned and belong to the acid-sensitive ion channel (ASIC) family. Toxins from animal venoms have been essential for studies of voltage-sensitive and ligand-gated ion channels. This paper describes a novel 40-amino acid toxin from tarantula venom, which potently blocks (IC(50) = 0.9 nm) a particular subclass of ASIC channels that are highly expressed in both central nervous system neurons and sensory neurons from dorsal root ganglia. This channel type has properties identical to those described for the homomultimeric assembly of ASIC1a. Homomultimeric assemblies of other members of the ASIC family and heteromultimeric assemblies of ASIC1a with other ASIC subunits are insensitive to the toxin. The new toxin is the first high affinity and highly selective pharmacological agent for this novel class of ionic channels. It will be important for future studies of their physiological and physio-pathological roles.